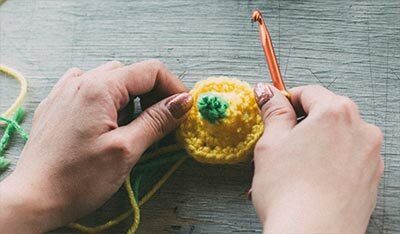 Linda Permann has been dubbed "crochet evangelist" by her friends at the LYS, and is passionately dedicated to showing off the possibilities of hooks and string. She is the author of two books, Crochet Adorned and Little Crochet, and also teaches online crochet courses at Craftsy.com. Visit her on the web at www.lindamade.com. Proclaim your love of yarn with this cute and quick to crochet heart badge. Written for small amounts of three worsted weight yarns, it's easy to mix and match your favorite precious scraps. Sew the heart on as shown, or leave the top open as a pocket to stash buttons or business cards. 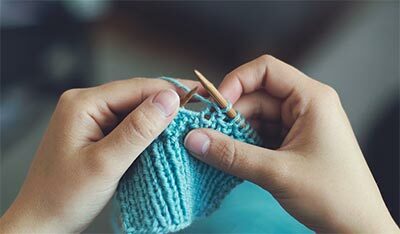 Holding the yarn a few inches from the end, wrap around your finger. Do not remove wrap from finger, insert hook into the wrap and draw up a loop of working yarn. Chain one to secure the loop, and remove ring from finger. Work stitches of first round in the ring. Pull gently, but firmly, on tail to tighten ring. Badge measures approx 4.5"/11.5cm in diameter. Rounds 1–4 of badge measure about 3.75"/9.5cm in diameter. NOTE: To change color in join of round, insert hook in first st of round. Yarn over with new color and draw through all loops on hook to change color and join round. Proceed with new color. Fasten off old color. Round 1 (right side) With A, ch 3 (counts as dc here and throughout), work 9 dc in ring; join with sl st in first dc (top of beginning ch)—10 dc. Round 2 Ch 3, dc in same st as join, 2 dc in each dc around; join with sl st in first dc—20 dc. Round 3 Ch 3, 2 dc in next dc, [dc in next dc, 2 dc in next dc] 9 times; join with sl st in first dc—30 dc. Round 4 Ch 3, dc in next dc, 2 dc in next dc, [dc in next 2 dc, 2 dc in next dc] 9 times; join with sl st in first dc and change to B—40 dc. Round 5 With B, [sk first st, 3 hdc in next st (shell made)] 20 times; join with sl st in first st—Twenty 3-hdc shells. Fasten off. With C, make an adjustable ring. Row 1: (right side) Ch 2 (does not count as a st), 3 hdc in ring; do not join, work back and forth in rows—3 hdc. Row : Ch 2, turn, 2 hdc in first st, hdc in next st, 2 hdc in next st—5 hdc. Rows 3–5: Ch 2, turn, 2 hdc in first st, hdc in each st across to last st, 2 hdc in last st—11 hdc at the end of Row 5. Row 6: Ch 2, turn, hdc in each hdc across. Row 7: Turn, sk first 2 sts, 5 dc in next st (shell made), sk next 2 sts, sl st in next st, sk next 2 sts, 5 dc in next st, sk next st, sl st in last st—Two 5-dc shells. Round 8: (right side) Do not turn, ch 1, sc evenly down side edge of heart, 3 sc in point (adjustable ring), sc evenly up other side of heart; working across sts of Row 7, 2 sc in each of next 5 dc, sl st in next sl st, 2 sc in each of next 5 dc; join with sl st in first sc. Fasten off. Weave in ends. Block badge and heart if desired, and let dry completely. Place heart on top of badge, with right side of both pieces facing you. With B, sew heart to badge by sewing in and out of the last round of single crochet stiches of the heart (Round 8), alternating straight stitch and back stitch. Sew pin back to top center of badge back.